The world's best chlorella. Here is why! is superior to any other chlorella or green food product. The highest among all the 20 + different species of chlorella. 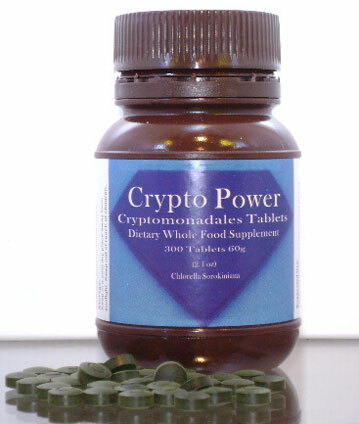 The registered international trade name for the USA brand name Crypto Power ™ Chlorella is: Cryptomonadales ®. Crypto ™ Chlorella This unique sub-species of chlorella sorokiniana is grown and processed solely by the International Chlorella Company of Taiwan. Cryptomonadales ® Chlorella is manufactured under World Health Organization GMP (good manufacturing practice) standards and carries the seal of quality and purity from the Taiwanese department of health. Anyone who is familiar with chlorella knows that chlorella's hard outer cell wall is the cause of its low digestibility rate. Until now, the best digestible chlorella on the market provided a digestibility rate (after additional processing to break the cell wall) of 85% in about 5 hours after it was taken. However, the actual absorption rate (how much the body is actually absorbing) is only about 73%. The wonderful news is that crypto chlorella has a soft outer cell wall, therefore it does not require its cell wall to be broken. Crypto Power Chlorella's digestibility rate is an amazing 95% in 1 to 2 hours after it is taken and the absorption rate is also nearly 95%. Less processing means more nutrition! A higher digestibility rate in a shorter period of time means more of crypto chlorella's nutrients are being absorbed into your body. In the first 2 hours after ingestion, crypto power chlorella delivers up to 25% more nutrition than any other chlorella product in the world. Any product is only as good as its ability to be used by the body. It's not the amount of chlorella you can digest but the amount your body can both digest and utilize that makes the difference. (2) High Chlorophyll and Phycocyanin Found Only In Crypto Chlorella. (3) PPARs : High PPARs Content Found Only In Crypto Power Chlorella. For more information about PPARs, three naturally occurring food substances found in significant amounts ONLY in Cryptomonadales Chlorella Sorokiniana, please click here. (4) CGF : Crypto Power Chlorella's High Growth Factor Content. Crypto Chlorella contains a naturally high amount of C.G.F. Chlorella Growth Factor. C.G.F. is not a single substance but contains a mixture of amino acids, vitamins, sugars and peptides particularly concentrated in the nucleic acids of RNA and DNA. Foods rich with nucleic acids are known to have anti-aging properties. * Both Crypto Power Chlorella tablets and powder naturally contain about 3% by weight CGF. In addition to the CGF contained in our tablets and powder we also offer 100% CGF in Veggie caps. Our Crypto Chlorella C.G.F. chlorella growth factor is a 100% pure nucleic acids extract. It has nothing else added. Crypto Power chlorella growth factor comes in powder form in 60 veggie capsules. Crypto chlorella's growth factor will powerfully enhance your positive effects if taken along with our 100% pure Crypto Power ™ chlorella tablets or powder. For more information about CGF, a powerful naturally occurring food substance found in significant amounts in our Cryptomonadales Chlorella Sorokiniana, please click here.